Niabella soli Weon et al. 2008 is a member of the Chitinophagaceae, a family within the class Sphingobacteriia that is poorly characterized at the genome level, thus far. N. soli strain JS13-8T is of interest for its ability to produce a variety of glycosyl hydrolases. 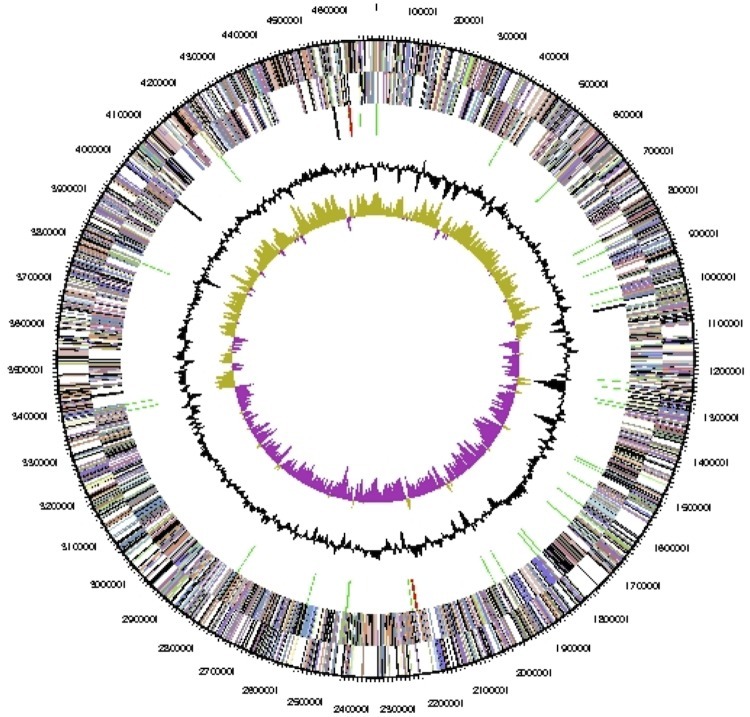 The genome of N. soli strain JS13-8T is only the second genome sequence of a type strain from the family Chitinophagaceae to be published, and the first one from the genus Niabella. Here we describe the features of this organism, together with the complete genome sequence and annotation. The 4,697,343 bp long chromosome with its 3,931 protein-coding and 49 RNA genes is a part of the Genomic Encyclopedia of Bacteria and Archaea project. Strain JS13-8T (= DSM 19437 = KACC 12604) is the type strain of the species Niabella soli , one out of five species in the genus Niabella . The strain was originally isolated from soil sampled from Jeju Island, Republic of Korea . The genus name was derived from the arbitrary word NIAB, National Institute of Agricultural Biotechnology, where taxonomic studies of this organism were conducted ; the species epithet was derived from the Latin word soli, of soil . Strain JS13-8T was found to assimilate several mono- and disaccharides and to produce numerous glycosyl hydrolases . There are no PubMed records that document the use of the strain for any biotechnological studies; only comparative analyses performed for the description of later members of the genus Niabella are recorded. Here we present a summary classification and a set of features for N. soli JS13-8T, together with the description of the genomic sequencing and annotation. A representative genomic 16S rRNA sequence of N. soli JS13-8T was compared using NCBI BLAST [4,5] under default settings (e.g., considering only the high-scoring segment pairs (HSPs) from the best 250 hits) with the most recent release of the Greengenes database . The relative frequencies of taxa and keywords (reduced to their stem ) were determined, weighted by BLAST scores. The most frequently occurring genera were Niabella (34.8%), Terrimonas (21.0%), Flavobacterium (14.9%), 'Niablella' (8.5%; an apparent misspelling of Niabella) and Niastella (8.2%) (13 hits in total). Regarding the single hit to sequences from members of the species, the average identity within HSPs was 99.7%, whereas the average coverage by HSPs was 96.8%. Among all other species, the one yielding the highest score was 'Niablella koreensis' (DQ457019; again a misnomer, see Figure 1), which corresponded to an identity of 95.1% and an HSP coverage of 99.9%. (Note that the Greengenes database uses the INSDC (= EMBL/NCBI/DDBJ) annotation, which is not an authoritative source for nomenclature or classification.) The highest-scoring environmental sequence was JF167633 ('skin antecubital fossa clone ncd2016g05c1'), which showed an identity of 95.3% and an HSP coverage of 95.7%. The most frequently occurring keywords within the labels of all environmental samples which yielded hits were 'sludg' (3.6%), 'activ' (2.6%), 'skin' (2.3%), 'wast' (1.8%) and 'soil' (1.8%) (236 hits in total) and reveal no deeper insight into the usual habitat of close relatives of the strain. Environmental samples which yielded hits of a higher score than the highest scoring species were not found, indicating that N. soli itself is rarely found in environmental screenings. Phylogenetic tree highlighting the position of N. soli relative to the type strains of the other species within the family Chitinophagaceae except for the genera Balneola and Gracilimonas. The tree was inferred from 1,395 aligned characters [8,9] of the 16S rRNA gene sequence under the maximum likelihood (ML) criterion . Rooting was done initially using the midpoint method  and then checked for its agreement with the current classification (Table 1). The branches are scaled in terms of the expected number of substitutions per site. Numbers adjacent to the branches are support values from 950 ML bootstrap replicates  (left) and from 1,000 maximum-parsimony bootstrap replicates  (right) if larger than 60%. Lineages with type strain genome sequencing projects registered in GOLD  are labeled with one asterisk, those also listed as 'Complete and Published' with two asterisks  (for Niastella koreensis see CP003178). Classification and general features of N. soli JS13-8T according to the MIGS recommendations , List of Prokaryotic names with Standing in Nomenclature  and the Names for Life database . Figure 1 shows the phylogenetic neighborhood of N. soli in a 16S rRNA based tree. The sequences of the two 16S rRNA gene copies in the genome differ from each other by one nucleotide, and differ by up to one nucleotide from the previously published 16S rRNA sequence (EF592608), which contains three ambiguous base calls. In a preliminary phylogenetic analysis of the 16S rRNA sequences from the family, we observed that two genera, Balneola and Gracilimonas, listed as belonging to Chitinophagaceae by [17,28,29], formed the root of the tree and were separated from the remaining taxa by quite long branches. For this reason, they were omitted from the analysis described above, and a second phylogenetic analysis involving the type species of the type genera of all families within the phylum Bacteroidetes was conducted, either unconstrained or constrained for the monophyly of all families . The alignment (inferred and filtered as described above) contained 17 operational taxonomic units and 1,384 characters. The best ML tree found had a log likelihood of -12,076.19, whereas the best trees found under the constraint had a log likelihood of -12,132.94. The constrained tree was significantly worse than the globally best one in the Shimodaira-Hasegawa test as implemented in RAxML  (α = 0.01). The bestMP trees found had a score of 2,432, whereas the best constrained tree found had a score of 2,485 and was significantly worse in the Kishino-Hasegawa test as implemented in PAUP*  (α = 0.01). (See, e.g. chapter 21 in  for an in-depth description of such paired-site tests.) This confirms our view that Balneola and Gracilimonas are misplaced as members of Chitinophagaceae (as all other families were represented by a single taxon only, Chitinophagaceae is the only family that might have caused conflict in this setting). Chitinophagaceae should thus be regarded to only contain the genera listed by  together with the more recently published genus Flavitalea . N. soli JS13-8T is a Gram-negative and non-motile aerobic bacterium . Cells are short rods 0.8-1.4 μm long and with a diameter of 0.5-0.7 μm (, Figure 2). Colonies are dark yellow due to the pigment flexirubin . Growth was observed between 15°C and 35°C with an optimum at 30°C . The pH range for growth was 5.0-8.0 with 6.0-7.0 as the optimum . The salinity range for growth was 0-1% NaCl . N. soli JS13-8T grows on several monosaccharides, disaccharides, gluconate, and D-mannitol . It produces numerous glycosyl hydrolases including α-galactosidase, β-galactosidase, β-glucuronidase, α-glucosidase, β-glucosidase, N-acetyl-β-glucosaminidase, α-mannosidase, and α-fucosidase . However it did not hydrolyze starch, chitin, or carboxymethylcellulose . The major respiratory quinone found in N. soli JS13-8T was MK-7, and the major fatty acids identified were iso-C15:0 (29.2%), iso-C15:1 G (18.4%), iso-C17:0 3-OH (11.8%), and summed feature 3 (11.1%), which is generally reported to include iso-C15:0 2-OH and/or C16:1 ω7c, although careful examination of the MIDI fatty acid reports generally allow a more precise identification . Smaller amounts of anteiso-C15 : 0 (1.2%), iso-C15:0 3-OH (2.2%), C16:0 (6.8%), C16:0 2-OH (1.3%), C16:0 3-OH (2.2%), C18:0 (3.8%), C18:1 ω7c (1.5%), C18:1 ω9c (1.0%), Summed feature 5 (comprising anteiso-C18:0 and/or C18:2 ω6,9c 3.4%) and an unknown peak with an equivalent chain length of 13.565 (1.1%) were also detected. The presence of major amounts of branched chain saturated and unsaturated fatty acids, together with significant amounts of 3-OH and 2-OH fatty acids is characteristic of members of this evolutionary group and also points to the presence of characteristic lipids, for which data is missing from this strain. N. soli strain JS13-8T, DSM 19437, was grown in DSMZ medium 830 (R2A medium)  at 37°C. DNA was isolated from 0.5-1 g of cell paste using MasterPure Gram-positive DNA purification kit (Epicentre MGP04100) following the standard protocol as recommended by the manufacturer with modification st/DL for cell lysis as described in Wu et al. 2009 . DNA is available through the DNA Bank Network . The genome was sequenced using a combination of Illumina and 454 sequencing platforms. All general aspects of library construction and sequencing can be found at the JGI website . Pyrosequencing reads were assembled using the Newbler assembler (Roche). The initial Newbler assembly consisting of 15 contigs in one scaffold was converted into a phrap  assembly by making fake reads from the consensus, to collect the read pairs in the 454 paired end library. Illumina GAii sequencing data (1,116.9 Mb) was assembled with Velvet  and the consensus sequences were shredded into 1.5 kb overlapped fake reads and assembled together with the 454 data. The 454 draft assembly was based on 158.8 Mb of 454 draft data and all of the 454 paired end data. Newbler parameters are -consed -a 50 -l 350 -g -m -ml 20. The Phred/Phrap/Consed software package  was used for sequence assembly and quality assessment in the subsequent finishing process. After the shotgun stage, reads were assembled with parallel phrap (High Performance Software, LLC). Possible mis-assemblies were corrected with gapResolution , Dupfinisher , or sequencing cloned bridging PCR fragments with subcloning. Gaps between contigs were closed by editing in Consed, by PCR and by Bubble PCR primer walks (J.-F. Chang, unpublished). A total of 45 additional reactions were necessary to close gaps and to raise the quality of the finished sequence. Illumina reads were also used to correct potential base errors and increase consensus quality using a software Polisher developed at JGI . The error rate of the completed genome sequence is less than 1 in 100,000. Together, the combination of the Illumina and 454 sequencing platforms provided 136.6 × coverage of the genome. The final assembly contained 354,991 pyrosequence and 14,750,629 Illumina reads. The genome consists of one circular chromosome of 4,697,343 bp length with a 45.2% G+C content (Table 3 and Figure 3). Of the 3,932 genes predicted, 3,882 were protein-coding genes, and 49 RNAs; 34 pseudogenes were also identified. The majority of the protein-coding genes (71.9%) were assigned a putative function while the remaining ones were annotated as hypothetical proteins. The distribution of genes into COGs functional categories is presented in Table 4. Graphical map of the chromosome. From outside to the center: Genes on forward strand (colored by COG categories), Genes on reverse strand (colored by COG categories), RNA genes (tRNAs green, rRNAs red, other RNAs black), GC content (black), GC skew (purple/olive). 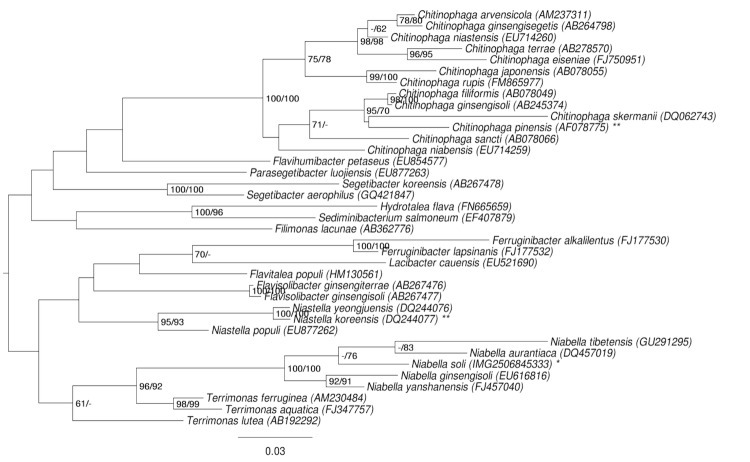 Two other complete genomes are available in GenBank from the family Chitinophagaceae – Chitinophaga pinensis  and N. koreensis (unpublished) – and the permanent draft genome of Sediminibacterium sp. OR43 is available from the IMG/GEBA website . Of these three organisms, N. soli is most closely related to N. koreensis (Figure 1). 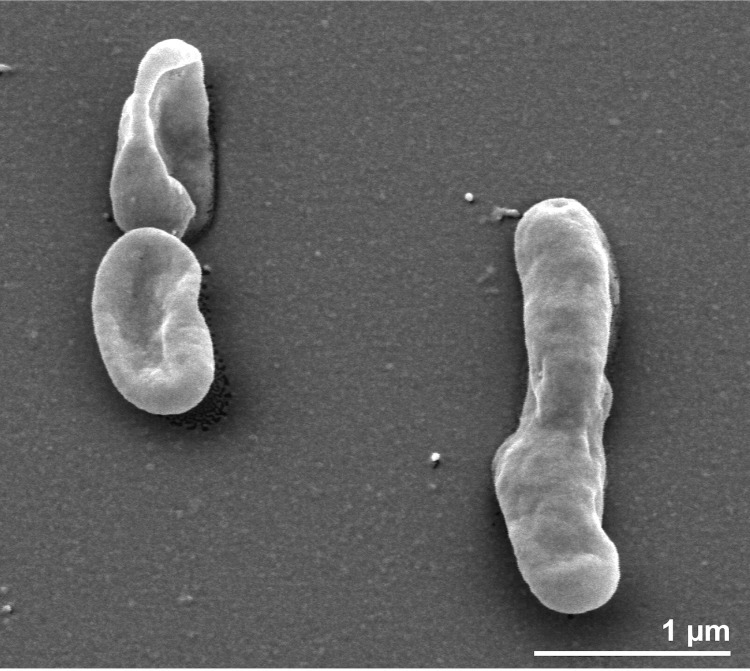 The genome size of N. soli is much smaller than those of N. koreensis and C. pinensis (9.0-9.1 Mbp) but larger than that of Sediminibacterium sp. OR43 (3.8 Mbp). Using the genome-to-genome distance calculator [49,50] version 2.0 revealed that 83.72% of all positions within HSPs are identical between the type-strain genomes of N. soli and C. pinensis, which corresponds to a DNA-DNA hybridization value of 26.60±2.42%. For N. koreensis, these values were 78.29% and 20.20±2.31%, respectively. A major feature of the previously sequenced genomes from this family is the presence of large numbers of glycosyl hydrolases. N. koreensis has 228 glycosyl hydrolases, while C. pinensis has 187 . We analyzed the genomes of N. soli and strain OR43 and found that they encode 164 and 86 glycosyl hydrolases, respectively. When viewed as a percentage of the total protein-coding sequences, glycosyl hydrolases constitute 4.2% of the N. soli genome and 3.1% of the N. koreensis genome. In the C. pinensis and OR43 genomes, glycosyl hydrolases account for 2.6% of the protein-coding genes. Thus N. soli has the highest density of glycosyl hydrolases in this family examined to date. In addition N. koreensis has 28 polysaccharide lyases while C. pinensis has only six . We found that N. soli has 15 polysaccharide lyases and OR43 has only two. Thus N. soli also has a substantial number of polysaccharide lyases in addition to glycosyl hydrolases. Of the glycosyl hydrolase families with many members in N. soli, some are also prevalent in N. koreensis and C. pinensis, for example families GH2, GH28, GH29, GH43, and GH78. However, there are GH families in which N. soli has a greater number of members than the genomes from other Chitinophagaceae – GH20 and GH106. N. soli also has enzymes from GH116 and GH123, which are not found in the other three genomes. There is also one GH family (GH92) for which N. soli has only two members, while N. koreensis and C. pinensis have 10 and 9, respectively. In Bacteroides thetaiotaomicron, the SusC and SusD outer membrane proteins are required for starch utilization  and the B. thetaiotaomicron genome contains many proteins related to SusC and SusD . The genomes from the family Chitinophagaceae also contain large numbers of these proteins. N. soli has 60 SusC family and 50 SusD family proteins, which is about half as many as in the larger N. koreensis and C. pinensis genomes. The Chitinophagaceae appear to rely mainly on symporters for sugar transport. Only two sugar ABC transporters were found in N. soli, one in N. koreensis, and none in the other two genomes. The phosphotransferase system is not found in any of the four genomes. In contrast N. soli has 23 sugar symporters, N. koreensis has 27, C. pinensis has 14, and OR43 has 12. The sugar symporters belong to several families, with the most prevalent being the Major Facilitator Superfamily (TC 2.A.1) and the Solute:Sodium Symporter Family (TC 2.A.21). We would like to gratefully acknowledge the help of Regine Fähnrich for growing N. soli cultures and Evelyne-Marie Brambilla for DNA extraction and quality control (both at DSMZ). This work was performed under the auspices of the US Department of Energy Office of Science, Biological and Environmental Research Program, and by the University of California, Lawrence Berkeley National Laboratory under contract No. DE-AC02-05CH11231, Lawrence Livermore National Laboratory under Contract No. DE-AC52-07NA27344, and Los Alamos National Laboratory under contract No. DE-AC02-06NA25396, UT-Battelle and Oak Ridge National Laboratory under contract DE-AC05-00OR22725, as well as German Research Foundation (DFG) INST 599/1-2. Krieg NR, Ludwig W, Euzéby J, Whitman WB. Phylum XIV. Bacteroidetes phyl. nov. In: Krieg NR, Staley JT, Brown DR, Hedlund BP, Paster BJ, Ward NL, Ludwig W, Whitman WB (eds), Bergey's Manual of Systematic Bacteriology, Second Edition, Volume 4, Springer, New York, 2011, p. 25. Kämpfer P. Class III. Sphingobacteriia class. nov. In: Krieg NR, Staley JT, Brown DR, Hedlund BP, Paster BJ, Ward NL, Ludwig W, Whitman WB (eds), Bergey's Manual of Systematic Bacteriology, Second Edition, Volume 4, Springer, New York, 2011, p. 330. Kämpfer P. Order I. Sphingobacteriales ord. nov. In: Krieg NR, Staley JT, Brown DR, Hedlund BP, Paster BJ, Ward NL, Ludwig W, Whitman WB (eds), Bergey's Manual of Systematic Bacteriology, Second Edition, Volume 4, Springer, New York, 2011. Felsenstein J. Inferring phylogenies. Sinauer Associates Inc., Sunderland, Massachusetts, 2004.